It is an undescribed species of shrimp that was previously incorrectly identified as Caridina gracilirostris. Dr Tim Page at Griffith University was kind enough to compare the DNA to other shrimps in the reference collection. Dr Page wrote - Your C. gracilirostris from Commercial production ponds groups with C. sp. Gulf1 (Page et al. 2007) from QLD and NT. It is not C. gracilirostris, which I also have in the tree. The other specimens I have of C. sp. Gulf1 come from Coomalie Creek NT, and the Archer, Wenlock, and Cloncurry Rivers all QLD. - we are grateful to Dr Page for this help with identification. 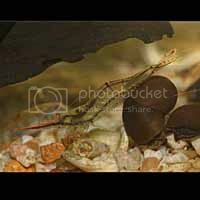 It is a very attactive small shrimp that needs to be kept with smaller non predatory aquarium companions. It is a good species for the consumption of algae in the planted aquarium but Caridina sp. NTnilotica is better. It will eat the various types of algae but if algae is not present (we wish) they will feed on normal fish foods. The colours of this shrimp are specks of white and red over a clear body with a long red rostrum. The colours are variable with them being more pronounced on larger specimens. The form cultured at Aquagreen is from the Blackmore River in the Northern Territory and is the most colourful form found to date. This species of shrimp has been found well inland in the Daly and Douglas Rivers in the Northern Territory. It is cultured in fresh water that is moving and well oxygenated . Other literature states that they require a brackish phase in their early life cycle stages, this was found not to be the case with larvae passing to young adults completely in freshwater. In the Aquarium - be very careful with tap water and other chemicals, always prepare your make up water a week before you need it and keep it in a shady place in the garden where mother nature can add the final preparations to making it safe. The practise of doing a waterchange from the tap and adding chlorine remover as you go is not recommended. Distribution: In Australia it is found in the NT and Qld, elswhere it occurs in the East Indo-west Pacific region.